Thank you to Mira and Tandem Literary for an opportunity to review A Million Little Things. It is the latest novel by Susan Mallery. This novel was given to me in exchange for an honest review. I received no financial compensation. @SusanMallery has received high praise for her Mischief Bay series. 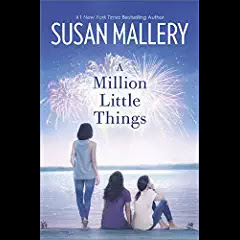 I am excited to share my first Susan Mallery novel. I met her once when I attended one of her signings. A Million Little Things is the third novel in the series. Zoe has watched her friends date, marry, and have families of their own. She recently ended a relationship that she thought had looked promising. Zoe wants to share situation with her best friend Jen. She is obsessed with her toddler son Jack. If he would just talk like other children his age. So Zoe decides to try something new and joined a pilates class at Mischief In Motion. She meets Jen’s mom Pam during class and forms a friendship. Pam decides to introduce Zoe to her son Stephen. They hit it off. The only conflict for Zoe is the relationship between Pam and her widowed father. Then she gets news from her doctor could cost her a new boyfriend and her relationship with Pam? Will she be able to come to terms with with all these changes? I liked this novel. Zoe is a very relatable character. I empathized with her during journey in this novel. I learned from my opportunity in meeting Susan Mallery what her writing process is. She uses a screen writing format. It was different than what I normally see in most other novels, but it works. The reader will feel like they are seamlessly transitioning from one scene to the next. The theme in this novel is letting your kids grow up and make with their own choices. Then parents giving them the freedom to do so. I look forward to reading more by Susan Mallery. You can purchase A Million Little Things here. Susan is also very active on Facebook. Welcome to Your Next Meal!